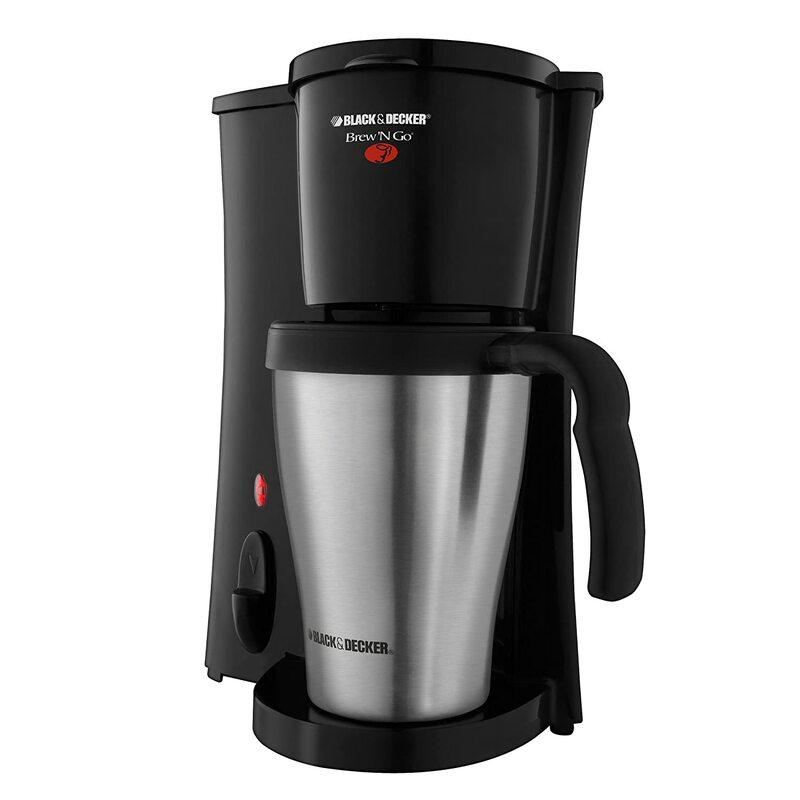 The Black & Decker Brew ‘n Go was designed specifically for people who enjoy or need to drink their coffee on the go as well as households with only one coffee drinker. A great gift for a coffee loving commuter or a new student off to college. The main feature that makes the Black & Decker Brew ‘n Go special is that unlike regular coffee makers, this one brews directly into a 15-ounce travel mug. Its tiny, doesn’t take up a lot of space and brews your coffee fast making it ideal for those mornings where you do not have a lot of time. This is the ideal coffee maker for numerous occasions and situations including student dorm rooms, personal office coffee maker, commuters and single house holds or house holds with only one coffee drinker. Another very cool feature of the Black & Decker Brew ‘n Go is its permanent filter. Having a permanent filter reduces the hassle with messy coffee pads or filters and you will also never be in a situation where you are out of filters. This feature is great if you plan on using this coffee maker or dorm room because you won’t need worry about making a mess in your office. Additionally, with the Black & Decker Brew ‘n Go you will never have to worry about looking around for a clean mug early in the morning when there is no time or when you show up late to work. The travel mug is made of stainless steel and is even tapered to fit most car cup holders, great for the commuter. The mug’s rubber handle and lid make it easy to grip and keeps the coffee nice and warm. The Black & Decker Brew ‘n Go also has an auto shut off feature that turns the machine off immediately after the coffee is done brewing so you won’t have to remember to turn it off when you are in a hurry. You can even use the coffee maker to heat up hot water if you are in the mood to make tea, hot chocolate or even instant food like noodles, soup and oatmeal. Both of these features are also extremely useful for college dorm rooms. In order to keep the machine clean and the coffee tasting good it is important to clean your coffee maker. This is also really easy when it comes to the Black & Decker Brew ‘n Go because the mug, filter, filter basket, and mug lid are dishwasher-safe. Besides all the convenience features, the Black & Decker Brew ‘n Go still brews a mean cup of coffee that not only tastes great, but gets you going as well. I can highly recommend the Black & Decker Brew ‘n Go to anyone who is in one of the numerous situations listed above or any other situation where a brew and go coffee maker is ideal. Students, commuters, single person and one-coffee-drinker households would all really benefit from the ease and convenience of the Black & Decker Brew ‘n Go. Moreover, as mentioned above, it is really the perfect coffee maker for on your desk in the office. No more going back to the pot the whole day only to find it empty, get your fix right at your desk. Not to mention, for only $15 that is pretty much a giveaway.